On Sunday, more than 40,000 Sunderland fans will help fill a sold out Wembley Stadium for the Checkatrade Trophy final against Portsmouth. 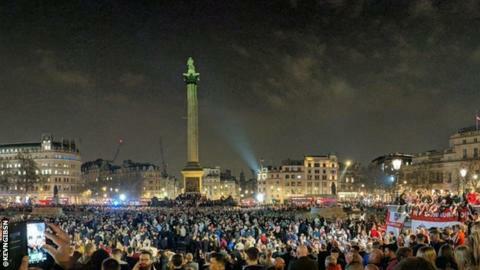 On Saturday night, thousands of those fans packed out Trafalgar Square in London. The Black Cats' fans have not had much to cheer in recent years after back-to-back relegations but Sunday's final offers the chance to win their first silverware since 1973. It is also their first Wembley appearance since the 2014 League Cup final when the then Premier League side lost 3-1 to Manchester City. Sunday's attendance is set to be the biggest for any final in the competition's history, surpassing the 80,841 who saw Wolves beat Burnley in 1988.